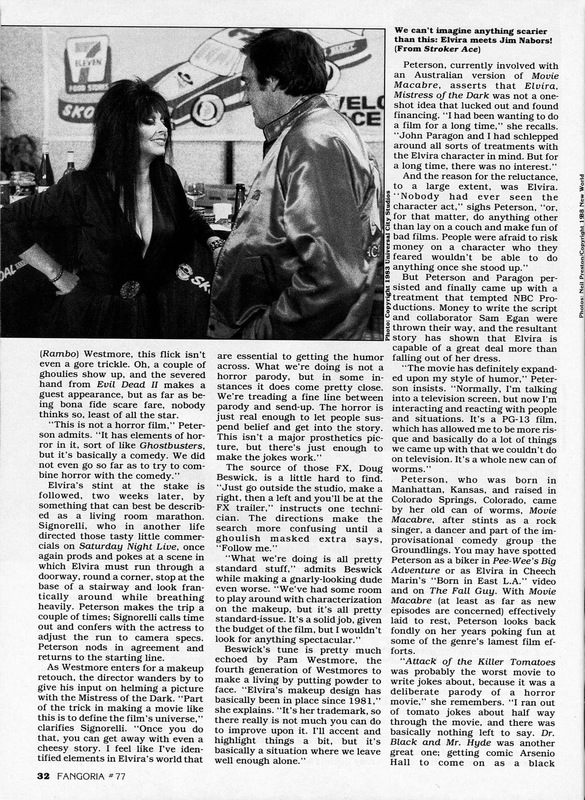 "Elvira is outstanding... well two bits of her anyway!" The ample charms of Elvira need no introduction but the eighties were her decade. Oft-overlooked, but once-seen, never-forgotten, is her low-budget ($7.5 million) theatrical mis-fire (it grossed a paltry $5.5 million domestically). New World Entertainment purchased Marvel Comics Group for $50 million in 1985 so, inevitably, Marvel churned out a comic book version (other New World tie-ups included HOUSE 2 (1987); CAPTAIN JUSTICE/ ONCE A HERO (1988); SLEDGE HAMMER! (1988)). Marvel's adaptation was a one-shot in a black and white magazine format. It's never been reprinted and there was no UK edition. MARVEL AGE MAGAZINE (issue 68, November 1988) ran a tie-in feature to promote it. Here's the movie trailer. It's got all the - ahem - stand-out moments in it. And here's a remix of the best scene from the movie intercut with other scenes. It exposes Elvira's real talents. Here is the video sleeve for the first UK VHS sell-through release. Elvria's Marvel one-shot wasn't her first (or last) comic book encounter. DC Comics had already nabbed her to front their 1986 revival of horror anthology HOUSE OF MYSTERY (previously 1951-1983). ELVIRA'S HOUSE OF MYSTERY ran for 11 issues (1986-1987) and a special. 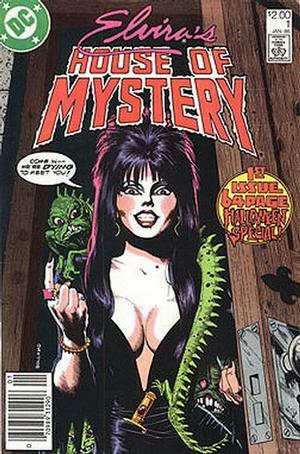 And the hostess of horror would go on to enjoy considerable longevity in Claypool Comics' ELVIRA MISTRESS OF THE DARK (166 issues, 1993-2007).